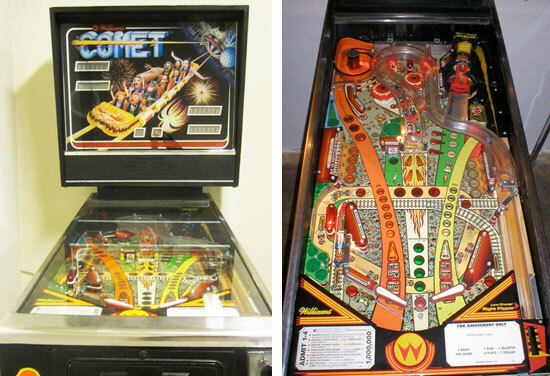 Check out these 1985 Williams Comet Pinball Machines for sale. You will also find parts and accessories including the Pop Bumpers, Speaker Upgrade, Flyer, Sound Board, Flipper Rebuild Kit, Fuse Kit, CPU Rom Chip Set, Translite, Playfield Plastics, Target Set, Mods, and Custom Target Decals. Comet was named after a popular ride at the Chicago's Riverview Amusement Park which has since closed. Affordable and fun game with a unique layout and lastability. First one million shot! !